How to hide recycle bin and view all site contents in SharePoint 2010 or Remove ‘All Site Content’ and ‘Recycle Bin’ link ? 2. 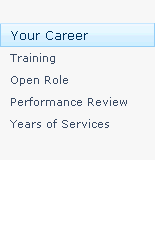 Check in your master page and publish your master page as Major version for everyone to see your change. 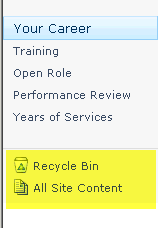 Now go back to you site and you won’t see View All Site Contents and Recycle Bin in SharePoint 2010 Pages. I’ve used your HTML to remove the recycle bin and all site content but it leaves a box at the top left where the recycle bin and all site content was which stops the rest of the page moving to the left. Could you tell me how to remove the box? Hi, thanks for the help, it works but only the administrators see the changing, the users or visitants see the all site content…can you help? Can you tell me how can we remove or hide the “Lists” link button which is used to create new list. If we delete from navigation then the lists name under “Lists” link button is spliting. I mean, if we create 2 lists with large name which will go under “Lists” link button. if we delete this “Lists” link button from navigation then my list name is spliting in new line. So i want to hide the option “Lists” link button from left navigation.How can i do this? This will remove just the recycle bin. 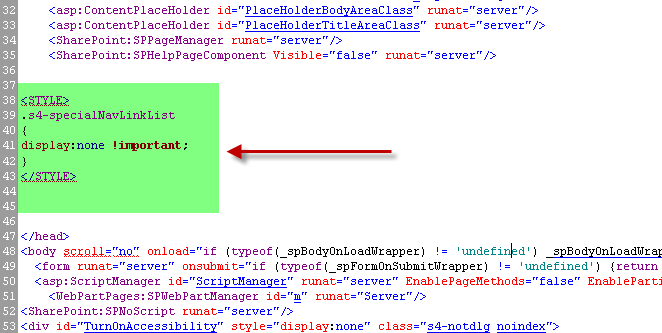 I have tried to remove both (Recycle bin and All sitecontent) with this code in v4.master. If Sharepoint\admin is logged everything looks well, this two links are disabled. For other users NOT. Any idea?